Surveillance video helped police locate an MMA fighter facing murder charges after he escaped a prison transport van in Southeast Texas, police say. Conroe Police Chief Jeff Christy said Cedric Marks escaped while wearing leg, hand and belly restraints. 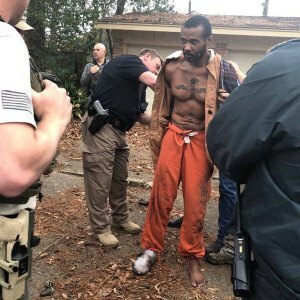 He was found Sunday hiding inside a 55-gallon trash can in Conroe, about 40 miles north of Houston, after a nine-hour manhunt involving multiple law enforcement agencies. 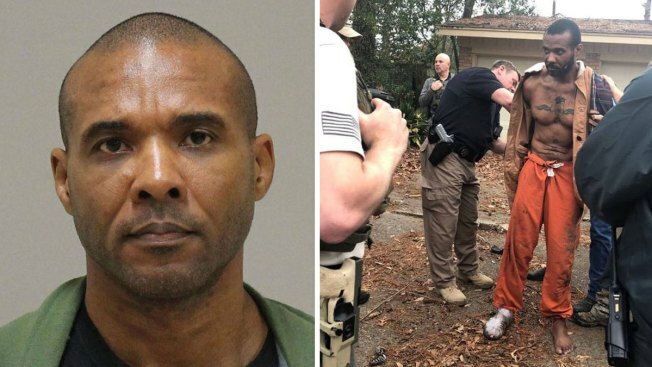 Police in Conroe, Texas, on Sunday found Cedric Joseph Marks hiding in a trash can. Murder warrants were issued Sunday for Marks in the killings last month of his ex-girlfriend, Jenna Scott, and Scott's friend, Michael Swearingin. Both disappeared on Jan. 4. Their bodies were found Jan. 15 buried in a shallow grave in Clearview, Oklahoma. Marks was arrested in Michigan last month on a Bell County, Texas, charge alleging that on Aug. 21, he broke into Scott's home in Temple, which is about 60 miles north of Austin. Authorities said he escaped while being transferred to Bell County to face that charge.